When it comes to clean eating, meal prepping is a great way to help you stay on track. It ensures you always have a clean meal available and no excuse to go buy junk. Therefore, today we will be talking about the best fitness meal prep containers for clean eating! I am going to list the best meal prep container for each category, but I recommend having different containers from different categories because how you divide your container is going to depend on your meal. If you’re eating an all in one meal like chili, you’ll want a single compartment. But if you’re eating chicken with 2 sides, you may want a 3 compartment meal. So it’s good to have a variety! FitPacker containers are super high quality and last a long time. I’ve had mine for over a year and they are constantly refrigerated, thrown in the dishwasher and microwaved- yet, they’re still like new. These are great because you can use them for so many things. Of course, I use them for meal prepping- but I also use them for just storing leftovers in the fridge. The pack comes with 16, so you’re just paying over $1 for each container that you will use endlessly. It’s an awesome deal for such great containers. 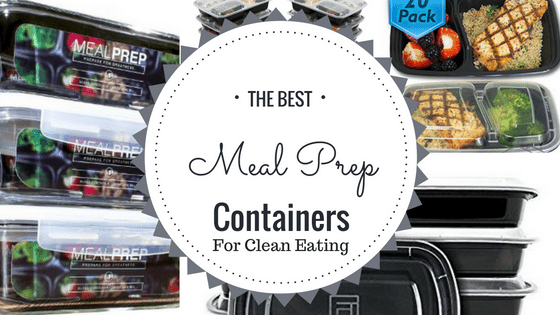 These 2 compartment meal prepping containers are a steal! The pack comes with 20 containers, so you are paying less than $1 for each container!! These containers hold 32oz of food– that’s a lot! They are also BPA free, microwaveable and dishwasher safe. They are a necessary staple for your meal prepping bag, 21 day fix, clean body cleansing and bodybuilding show preparation. You can even use them for your kids! These meal prepping containers are extremely durable and hold up to 32oz of food! These bento lunch boxes give you the ultimate compartmental separation. Each compartment capacity holds: 8 oz., 8 oz., 16 oz., which are ideal portion sizes to get you into the body you desire! It really makes it easier to keep track of your portions and nutrients! Of course, they are also fully reusable and safe to use from freezer to microwave to dishwasher. Each compartment container keeps food contained to prevent sogginess and keep food long term, making them perfect for freezing meals. If plastic just isn’t your thing and you feel more comfortable with glass meal prep containers, these are a great option for you! They are made of durable glass that is non-toxic and stain proof. They are also oven safe up to 450°F, which means you can cook your meals right in to their containers- now that’s awesome!! Glass containers pretty much last forever, so this is an amazing deal at just about $10 for each glass container! If you work outside of the home, or just spend a lot of time outside of the home, having an insulated lunch bag that allows you to carry your meals with you is a great idea. This fully insulated cooler bag will keep your food fresh and cool/warm while you are on the go. It holds up to 4 meal prep containers and a bottle of water or a shaker cup. You can even use this to carry healthy meals for the entire family if you are having a long day out and don’t want to end up spending money on junk! Hands down, the best place to buy meal prep containers is online. As you can see, you can get high quality containers for as low as $1 per container. The ones I have tried from stores have either been low quality or way too expensive. I have already found my favorites, which are the ones above, and wouldn’t buy any in store again.